The WheelSurf is a monowheel vehicle consisting of two frames, an inner frame and an outer 5' 7" frame. The Wheelsurf rider sits inside the inner frame along with a 56cc two stroke Stihl engine and the petrol tank. 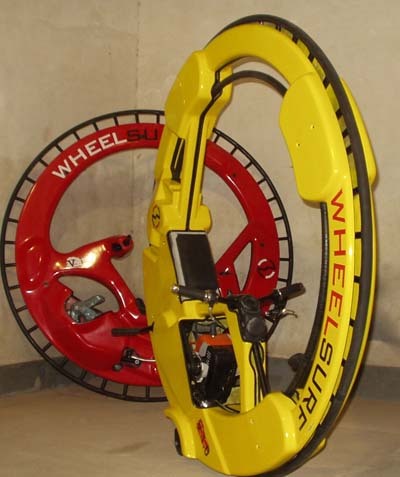 The Wheelsurf tops out at around 30mph (50km/h) and the monowheel configuration gives the rider a unique experience. Currently the WheelSurf is not road legal, and because smooth flat surfaces are the best place to run a monowheel this may be a problem. However, this unique monowheel is also marketed for use in promotional displays and sheer frivolous enjoyment. The overall weight of the Wheelsurf is 50kgs.